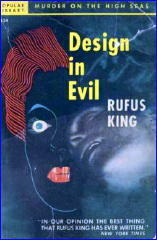 » Reviewed by William F. Deeck: RUFUS KING – Design in Evil. Reviewed by William F. Deeck: RUFUS KING – Design in Evil. Dr. Crowninshield, an authority in the psychiatric area who has reached an age and a level of experience that allows him to abandon doubt and uncertainty, has concluded, after no examination whatsoever, that Miriam Lake is really Jennifer Murcheson, wealthy and very peculiar even when normal, who mysteriously left her ranch In California and is now suffering from schizophrenia. Crowninshield’s assistant, Dr. Stone, is also convinced that Lake is Murcheson, but he is certain she is faking the alleged illness. By some dastardly plotting and a little arson, the Murcheson family — uncle, aunt, and cousin — get Lake aboard their yacht en route to the Caribbean. Ostensibly the purpose is to effect a cure. Lake, however, begins to realize that it is someone’s design to murder her at sea in order to gain the real Murcheson’s fortune. With the “scientists” aboard the vessel having their minds made up, her claims and attempts at proof are ignored. Thus her situation is both frustrating and perilous. The more I read of Rufus King’s novels, the more I am impressed by their general high level. His plotting is usually first class, the atmosphere of menace is almost always well done, his suspects are often few, something appreciated by this feeble-minded reader, and the clues are generally fair. While he has a weakness for polysyllables, so do I. Characterization sometimes is a bit weak, but King often makes up for it by his humor. In this novel, Lake’s amusing comments in the face of her obvious danger keep the novel from becoming just another damsel-in-distress type. I agree with William F. Deeck that Rufus King is an interesting writer. I’ll second (or third) Mike and William F. Deeck’s commments on King. Both his series about Lt. Valcour and Stuff Driscoll and his stand alone novels like this one are good. Fritz Lang’s Secret Beyond the Door was based on one of King’s stand alone psychological suspense novels, and he made up in plot for any drawbacks in character. Waiting to be posted are at least two more reviews of Rufus King’s mystery fiction. The author of something like 30 novels and story collections between 1927 and 1964, Rufus King was very popular in his day, but he’s all but forgotten now.